As promised, here is the second part of my article on prey drive promotion. Naturally, I won't start at the beginning of prey drive training again. I am going to make the assumption that the reader has read part one of this article in order to continue my discussion. There are several exercises that I personally feel should be started during prey drive promotion training, these exercises are going to be the focus of this article. He bites a rag firmly and holds onto it. He keeps the rag in his mouth and carries it for short stretches. He can jump up and bite a rag in one motion. He barks at the motionless helper to create action. He runs towards the helper then jumps and bites to make prey. I can move the sleeve more freely and therefore stimulate the dog stronger. I have found that some dogs have no hesitation biting an object in the beginning, but they act hesitant when biting a "part of the helper." In the initial phases of this training we should take great care to remove all hesitation or inhibition in the dog to allow his drives to come out as strongly as possible. A word of caution for this stage in training. As helpers we have to realize that the sleeve is much more a part of us than the sack ever was. We have to be very aware of this and remember Dr. Raiser's words: "If one tries to promote prey drive, then all the dog's focus should be on the prey, meaning that it is the prey that does all the moving around, not the helper. Furthermore, the prey never moves towards the dog, but always away from, even after it is grabbed." Why do I make such a big deal about this you ask? The answer is simple, it is a big deal. As we try to move the sleeve in a wild and sporadic manner we also move around a lot and it is very easy to move in a way which is viewed as confrontational by the dog. Which in turn is totally counterproductive to prey work. Another very common problem in this stage of training is that the sleeve is moved towards the dog, sometimes quite forcefully. Very few things annoy me more when I work a dog than seeing a young dog get out of the way of the sleeve to avoid being hit with it, or to avoid having it rammed down his throat. "Prey always moves away from the dog." This applies to the sleeve as much as it did for the rag. Now that I am done preaching, let me describe what the work should look like. As already described above, the dog's prey drive is stimulated by the moving sleeve, he keeps reaching and snapping at it but so far in vain. Now it is time to give the dog an opportunity to bite, for this the sleeve can be held by opposite ends, or it can be worn on the helper's arm. The helper passes by the dog laterally (not towards him) and presents the sleeve. The dog needs to be allowed a good opportunity to bite the sleeve. The dog may be a bit unsure by the feel of the new prey, so he should win it right away, even if the bite is a bit weak. This is a teaching exercise, so we want to show the dog where on the sleeve we want him to bite, by only allowing him to bite the correct area on the sleeve. As soon as the dog has won the sleeve we work on getting him to hold on to it. The same two methods work I described for sack work, have rope or leash on the sleeve to tug on it when the dog wants to let it go, or challenge the dog for his prey right away. I follow the same training steps as with a sack to get the dog to hold his initial grip on the sleeve. As with the sack, the sleeve will then be presented progressively higher until the dog again has to jump and bite to make prey. Remember, there is no rush to put a dog on a sleeve. At this point I feel it is necessary to briefly talk about the strike or attack exercise again. 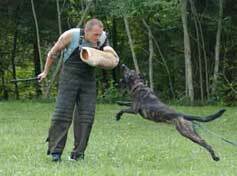 As I described in my last article, I start this exercise with a sack already if I can, to teach the dog targeting technique and to lower inhibitions in the dog when it comes to biting prey on a helper who is facing the dog. Those two points are very important, and present us with new problems when we are working with a sleeve. The dog has to target more accurately to get a good bite on the sleeve. The helper has to be very careful to catch the dog softly, so the dog does not hurt his mouth on the sleeve. And, the sleeve is much closer to the helper's body, so the frontal picture is much more ominous for the dog. Raiser describes that he starts this exercise by moving laterally to the stimulated dog, then the dog is released when the helper gives the signal. Initially the dog gets a shot at the helper and sleeve more from the side than frontally. Gradually the dog gets more and more of a frontal view when he makes prey, until he attacks straight into the helper with the sleeve horizontally across the helper's chest. During all these bites it is always important that the helper compensates for any problems the dog may have, and that he always absorbs the dog's impact softly. I teach this exercise very similar in principle, but somewhat different technically. Let me describe it briefly. The dog, who is held by the collar, is stimulated by the helper in prey, the sleeve moves a lot, and I usually let the dog snap and miss a couple of times. Then I move away from the dog, always making sure that his eyes are fixated on the sleeve (remember, we are working the dog in prey at this stage), by wiggling it. In the beginning I don't move more than about 5-10 meters away from handler and dog. When I have reached my catching spot, I bend over wiggling the sleeve around just above the ground. When the dog is nicely pumped up, I give the handler the signal (something pre-arranged) to let him go. The dog charges at the frantically wiggling sleeve, when the dog comes to within a distance where he is setting up to target and then leap, I stand up and pull the sleeve up with me to a height I think the dog can easily reach. This last minute "escape" manoeuver by the prey (sleeve) prompts the dog to follow the movement of the sleeve. The dog will leap upwards and forwards to catch the sleeve which moves upwards and backwards (prey moves away from dog). Contact should be timed so it occurs when the sleeve is in the position it normally is in when a helper performs any frontal trial exercise. The impact from the dog has to be absorbed by the helper, who then goes on to set the dog onto the ground. In the beginning the dog will win the sleeve at that moment. I feel that this method brings great success with dogs who do not naturally strike hard. The dog strikes the helper frontally right from the start without realizing it because he should be completely mesmerized by the last second movement of the sleeve. As I said in the beginning the principle, making the exercise about the prey, is the same it is just executed a bit differently. A word of caution regarding this method, it takes good timing on the part of the helper. I would recommend that helpers practise this manoeuver with experienced dogs who already strike well, before they experiment around with dogs who are just learning. The next skill the dog should learn during prey drive promotion is the active counter. In his book Dr. Raiser titles this chapter "Teaching the Dog to Fight." Let me take a moment to remind the readers that none of the described exercises have to occur exactly in the sequence I am outlining them. 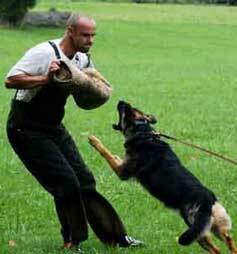 I sometimes teach the countering much earlier in training if the dog allows it. However, I do believe that biting a sleeve, striking, and countering are techniques a dog must master before trial exercises are put together. Now back to countering. What is countering? Let me give you my definition. Countering is any type of assertive behavior on the part of the dog when he feels adversity (stress) during a bite-exercise. The most common forms are forceful tugging, growling, re-gripping, and shaking. Dr. Raiser concentrates pretty much on the "Shaking Prey to Death" behavior in his book. My preferred reaction is the re-gripping behavior, because I feel it has the most benefits for the dog, especially in his sport career. For the purpose of this discussion, I will use the term countering. 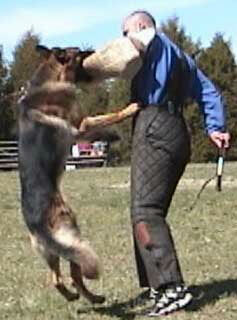 Teaching countering depends very much on the dog, we have to tailor our training to the individual dog. To quote Dr. Raiser: "In dogs with very strong drives and in some insecure dogs it is relatively easy to provoke the "shaking-to-death" behavior. 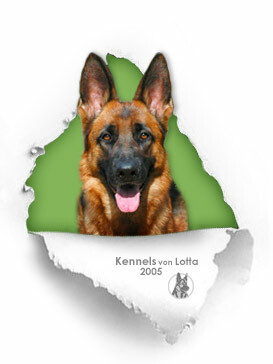 In other dogs that might not be possible until the are 15 months or older or until the have undergone heavy defensive drive promotion." For that reason I believe very strongly that we should keep the teaching of this technique in mind at every stage of training so that we do not miss an opportunity. We have to recognize countering behavior for what it is and reward it whenever it occurs, even if we are working on another exercise. Let me describe how I teach countering. The dog gets a bite on leash. While the dog is holding on the handler should hold the leash tight, the helper should keep the bite object (sleeve or rag) calm and steady. The helper should also not be confrontational with the dog, meaning he should keep the dog behind him a bit. Now remember, it is adversity which provokes the dog to counter. So, we have to create adversity in very small doses. We flex our sleeve arm, as if the prey animal has found new strength. We can cover the dog's eyes with our hand. We can face the dog more frontally. We can tickle his throat. We can lift the dog up a bit. We can rub the dog with a stick. We can drag him towards a foreign object. We can blow in his face. The possibilities are really endless, as long as we always keep in mind that it is always better to create too little adversity than too much. The adversity is designed to cause the dog a bit of stress and make him feel slightly insecure. Immediately following the stress, should be a moment when the stress causing factor lets up a bit. The dog will perceive this as if the adversary is experiencing a moment of weakness. Dogs with normal drives and instincts will take this moment of weakness to assert themselves, and this assertion is our counter. What we have to realize is that it is stress which triggers the counter. We may cause the dog stress unintentionally any time during training, so if the dog counters at any point in early training, we have to let him win. We can do this by stripping the sleeve, or by relaxing and giving up momentarily before we continue with what we were doing. We have to really feel out a dog to see what method of triggering the counter is best so that we do not create grip problems. In the beginning I reward any countering behavior so I will not create insecurities in the dog ( Raiser: "unaffected tolerance of aggression causes insecurity"). However, as the dogs confidence and skill repertoire grows, I become more choosy as to which counters I reward, and which ones I do not. For example, a dog with a very shallow grip who shakes violently will not reach his goal from me for very long, I will wait for a re-grip before I will reinforce his counter. In general I would say that I only reward the shake, growl, or tug as a counter in the very beginning of training and later only with dogs whose grips are very full and almost perfect. But once again I have to judge each situation as it happens, nothing is chiseled in stone. If the above method, which by the way is very similar to what Dr. Raiser describes in his book, does not lead to the desired countering behavior, then we probably have to wait until the dog is more mature, and defensive drive promotion has begun. Before I wrap up prey drive promotion, I want to discuss one more exercise, which I consider imperative for prey drive work. That exercise is exploding into drive from the control phase. For this I need a dog advanced enough in training that he bites a sleeve (or at least a puppy-sleeve) and preferably already counters (preferable, but not absolutely necessary). One very common but also huge problem I encounter all the time is that very competent dogs suffer tremendously from handler influence (however mild it may be). A dog's drives are inhibited by obedience, after all, obedience teaches the dog that the handler decides when he can and when he cannot follow his instincts. 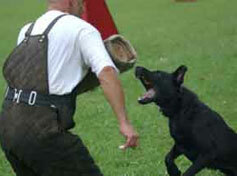 It is only natural then that after obedience during bitework the dog's biting performance may suffer. Let me anticipate some criticism here. Has this guy never heard of drive capping? Of course I have, and for the readers who have not, drive capping refers to harnessing or collecting drive through obedience. Unfortunately, it takes a master to make that technique work well, and not all of us, myself included, are masters at it. The exercise I am about to describe in a way serves the same purpose, only that the dog learns to do it himself, rather than the handler doing it for him. The way I start this exercise is to set a dog up like in the SchH II and III escape. In other words, I get the handler to make his dog lie down, holding him by the collar. I stand sideways to the dog the sleeve facing the dog. The agreement is the handler releases the dog as soon as I take a step. I then perform a run away. The dog should follow and bite the sleeve. As soon as he has a firm grip I will strip the sleeve, the dog gets to make prey. Initially I find that the dog's grip may not be as convincing as it is during the exercises with heavy stimulation. The dog may even act a bit half hearted, after all, first he has to be obedient by lying down, then he has to be dis-obedient by breaking the down. And still he has to muster enough drive to catch the helper and bite the sleeve. This exercise is harder on dogs than people realize, and I am sure every helper will agree with me that a lot of dogs show diminished bite performance in the beginning stages of this exercise. The exercise evolves to where the dog has to down off leash and stay put until the helper moves. This takes quite a bit of control. The next step is to make the dog heel around a bit, then down, then the escape. Next we have the dog heeling around with some sits for pauses, then when the dog shows nice collected heeling and sitting, the helper jerks the sleeve while the dog is in a sit, to allow him to come for a frontal strike. 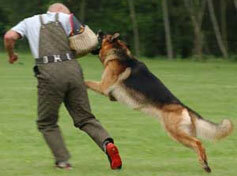 The attentive reader will recognize this as a very close approximation of the attack on handler exercise in SchH I. Finally, I have the handler heel around me and do one of the sitting pauses while behind me, then I will spin around and jerk the sleeve, to let the dog bite. The down before the SchH II and III escape, the heeling to the blind for the attack on handler in SchH I, and the rear transport in SchH II and III before the surprise attack, are huge handler pressure exercises in trials. Dogs who have learned how to explode into drive from an obedience phase will have fewer problems with these exercises. I deliberately teach this exercise during prey drive promotion, because I feel that dogs learn this exploding into drive easier while they still work purely in prey drive and not carry any extra baggage from the stresses of defensive drive work. Naturally, the amount of obedience has to be tempered to the dogs level of proficiency in obedience. The goal of prey drive promotion has been reached when the dog has learned that the presence of a helper on the field means that the prized prey cannot be too far away, that he can incite the helper into action by barking and when he has mastered good gripping technique, fast, hard striking, countering, and exploding into drive from obedience. At that point, the field, the helper, and the sleeve have all become trigger stimuli for the dog's prey drive. If we were able to lay such a solid and strong foundation in protection work in prey drive we are well on the road to success on the sport field. Of course, as wonderful as prey drive is, it is not without downsides. One of the biggest problems is that prey drive can be exhausted or fatigued. This means a point may come when the dog just does not feel like chasing or catching prey any more, Raiser calls this "Stimulus-and Action-Specific Exhaustion". When the dog's prey drive is exhausted training is over for that session. If exhaustion sets in very quickly, it becomes very difficult to make gains. Another problem with prey drive may be that the prey drive in a particular dog is not strong enough to even bite a sack competently. 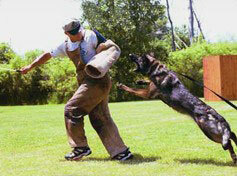 With dogs like that training is frustrating and no progress can be made working only in prey. I am not making these comments to cast a negative light on prey drive work, on the contrary, foundation work should always be based on prey drive. But I want to make it clear that training is not over by any means yet at the end of prey drive promotion. We still have to work with the dog's defensive drive, and then we have to work on channelling defense drive into prey drive, and how we can work on balancing the two drives. I hope to get the opportunity to discuss those exciting topics in future issues, as well as explaining some specific cynological (dog related sciences) terminology.